I stumbled across a fascinating new blog: David Lereah Watch. 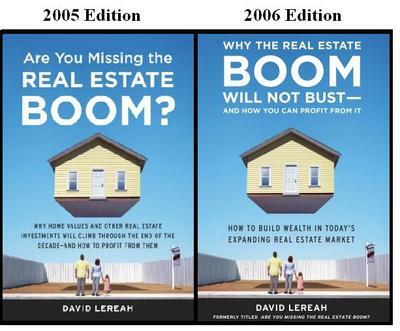 "David Lereah is the Chief Economist and Senior VP of the National Association of Realtors (NAR). Mr. Lereah regulary makes statements regarding the housing bubble. The media regulary turns to him for real estate quotes. He is very influential. Mr. Lereah tells half truths and manipulates facts and figures. He cannot be trusted as he is a paid shill." Geez, its as if people pay attention to what you say and make you accountable. One of the more interesting things I came across on David Lereah Watch was the new version of his book. You may recall we discussed this last months in Are You Missing the Real Estate Boom? Too funny -- thanks Kev . . .
Lereah is nothing but a well paid cheerleading shill for the RE Industrial complex.His analysis makes Mary Meeker and Henry Blodgett seem like Warren Buffet.